We where the bands that played in the shadows of the big local bands ( in this case bands like Beathovens, 14, MT Else, etc). These bands in turn had to settle with playing in the shadows of the bands that where established all over the country, like Tages, Shanes, Namelosers and others. We where the bands that really did practice in basements and garages and whose equipment consisted of all kinds of gathered things, assembled from old radios, speakers and amplifiers. The drum sets would today only be good for display in a museum somewhere. The height of a career could be not having to play as first band in one of the many frequent pop shows that where held almost all weekends at different locations in the province. One important ambition was to get together a repertoire that lasted long enough for a school dance, 25-30 songs. That these never had more than three chords each was a matter of style. If there were more, then it was jazz. To tune the instruments with any sort of precision was considered snobbish. We were mods, and we where the first generation to declare war on the adult world and its values. We have had many followers. 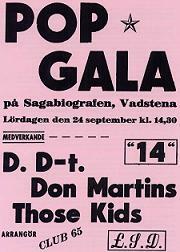 The pop shows in Vadstena where magnificent events. The days before the concerts was a very exiting time for us mods and others interested in music. The order in which the bands would play was discussed and there were intense speculations about what new songs could be expected to appear on the repertoires of the featured bands. -If Beathovens are playing “Cadillac”, then we can’t do it. “14” was a fantastic live band with two great singers that sang their pops songs, respectively, R&B songs. I will never forget their rough version of Chuck Berry’s “You Came A Long Way From S.T. Louis”. The rule of the local scene was between them and Beathovens. But there where many other unforgettable and sometimes unlikely constellations that showed up at the concerts. Harwesters from Vikingstad where one of these bands.I remember them as a mixed group, girls and guys 15-16 years old that played only Stones covers with a hick, punk attitude that surpassed most of what I’ve heard since that time. “Don Martins” that were from Mjoelby were another super group. During their best period their shows revolved around the “Sorrows” LP from ‘65, and they played the material with impressing precision. “Those Kids” where a duo that had one of the best singers of that time on the mic. They did songs like “Eve of Destruction” and others. His voice was powerful. The sixties classic place for rock music for us that lived in those regions was Gillet in Motala.During a few years Gillet received the elite of what Swedish pop and rock had to offer.I especially remember the “Panthers” from Ljusdal that were damn cool, and actually the “Sleepstones” that played the “Five LiveYardbirds” LP straight through. At an amazing speed. The best local bands, Beathovens gigs at Gillet are classic, also got a bit of attention. LSD though, never had enough status for an offer like that. But we clearly had it going on and had a group of fans when we split up in ‘67. This was a consequence, I remember, of someone getting pretentious and starting to talk about melody and more chords. Klunk’s Klan was the embryo for LSD. Three 13-14 year olds first inspired and totally unschooled expressions for the need to participate in what now is called R & R.
WWH (We Want Help) was a band that competed with LSD. They had a more polished image and new a few more chords. Vadstena probably wasn’t too different from other small towns during the middle of the sixties. It was a sleeping ideal world, and it was against that we were reacting. In the years of 65-66 there were probably 5-6 active bands, out of which one was all girls band. In the neighboring city Motala there must have been twice that number. Many had charm as well as class. 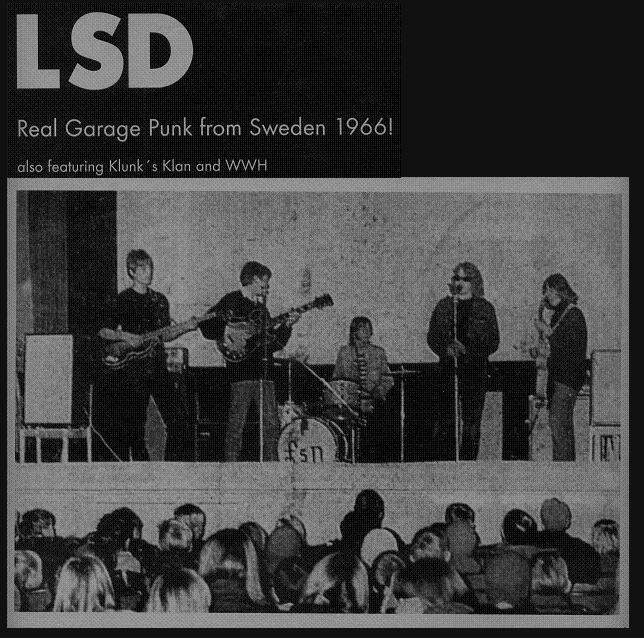 Klunk’s Klan, that never played to the public, and LSD, that opened up a few pop shows, perhaps didn’t have the greatest talents. But we took part in defining a period and we where totally dedicated to our mission.